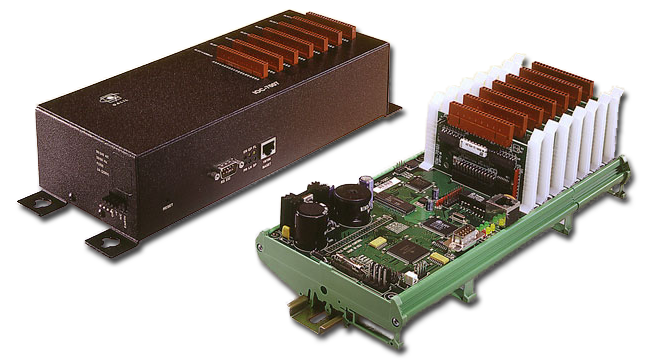 Please see the RIO-471xx PLC for information about a newer, more compact and cost-effective I/O controller. The IOC-7007 Ethernet I/O controller provides an intelligent solution for handling inputs and outputs. The IOC-7007 controller base accepts up to seven Galil I/O IOM modules. IOM modules are available with TTL inputs, optoisolated inputs, optoisolated outputs, high power outputs, dry contact relays, analog inputs and analog outputs. The IOC-7007 is programmable and includes 500 lines of non-volatile program memory, variables, arrays and multitasking for concurrent execution of up to eight different programs. The controller also includes 1 PLC thread with deterministic timing. The programming language is similar to Galil's motion controller language allowing seamless integration of motion and I/O. The IOC-7007 is available as a packaged unit , as a DIN rail mount unit , or as a card-level unit. The box-level version accepts 90-260 VAC or 20-60 VDC. The DIN rail and card-level unit accept 20-60 VDC. Intelligent Input/Output controller includes 32-bit microcomputer with memory and multitasking for programming I/O events. Install up to seven plug-in "IOM" modules to handle many input and output functions. Supports MODBUS in both master and slave mode for interface to other MODBUS devices.